Most sales organizations are plagued with high sales rep churn / attrition. Sales organizations are so used to expecting high rep churn that they build it into their models. The guilty parties go beyond the Sales Leader, though! The CFO, the CEO and the Board are equally complicit in supporting and perpetuating the accepted myth that “you’ll lose 30-40% of your new sales hires – so be sure to hire in large groups.” To meet the expected demand of sales rep churn the Sales Leader, aided by HR and Recruiters, start rashly hiring unqualified sales reps – which only contributes more to the sales churn issue. What is often not calculated in the Sales Leader’s nor in the CEO’s models is the financial impact of high sales rep attrition. It is estimated that the true cost of losing a sales rep is 1.5 – 2x their annual compensation (based on on-target earnings). So, if you hire a start class of six new sales reps in January, with an expected quota achievement of $800k annually, assuming a generous 4 month ramp period, and assuming they all hit 100% of quota (yeah right!) the team of six should generate $3m in net new revenue for the company (~$500k x 6 = $3m). The budgeted compensation for a sales rep to carry a $1m is probably around $120k Base / $120k Commission for a total of $240k OTE. Factor in an additional 20% for overhead, the cost for a single sales rep is approximately $288k. Based on their estimated comp, the “cost” and “lost revenue” to the organization is 2 x $288k for each rep! If you churned 2 reps the estimated cost is 2 x $288k = $576k x 2 = $1.15m. Most of the Sales Leader models account for reps churning out – but they don’t calculate the “cost” of the churn. 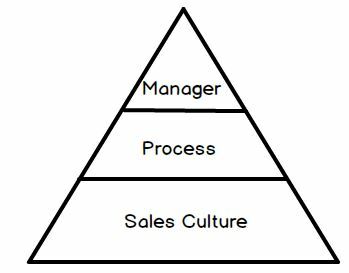 Notice that at the base of the pyramid is Sales Culture. We’ve distinctly labeled the foundation of the pyramid as Sales Culture and not “Company Culture” because we’ve seen sales organizations transform entire companies. We are not going to blame the Company for having high sales rep churn – in fact – it is up to the Sales Leaders to create a Sales Culture that will help the reps succeed and grow *in spite* of the Company culture. Does the Sales Culture foster growth, learning and opportunity? Does the Sales Culture punish those who take risks or try to think creatively? Does it reward hardwork, ethics, CRM hygiene, doing the right thing for the customer, etc? These values might not be embraced by the entire company but that is no excuse for the Sales Team to do the same. The Sales Team is on the front line with customers on a daily basis – they are the face of the Company. The Sales Team are the Ambassadors of the Company – the culture that is fostered by the Sales Leaders matters. If the Sales Teams feel like Ambassadors then they’ll take pride in their work and their interactions with prospects and customers. 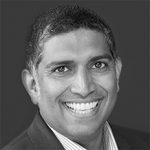 Even if the greater company doesn’t espouse this – it is up to the Sales Leader to cultivate these values. If you have the wrong sales culture – your reps will leave – if you have the right sales culture then your reps will eventually transform the entire organization. Sales reps leave organizations that have the Wrong Sales Process. The sales process that they are expected to follow is focused on the wrong things. It doesn’t move the prospect through the buyer’s journey and certainly doesn’t assist the sales rep – instead, the sales process is a burden to the rep. In these cases, the sales reps look at the process as a hurdle to jump over. It is an obstacle to their success. Wrong sales processes demotivate sales reps because they are too busy entering CRM data instead of doing what they should be doing – talking to customers and selling. Expecting your rep to do more data entry so that you can get the right reports out of the CRM is a sure fire way to break their spirit. You hired your reps to sell – not to be data monkeys. If you have high sales rep churn – it isn’t the rep’s fault – its probably your process. Its probably wrong. We’ve all heard the phrase that employees don’t leave companies – they leave managers. The phrase implies that an employee will tolerate a lot about a company (bad culture, poor compensation, inequality, stifled innovation, etc) IF they have a manager who supports them, fights for them, coaches them and offers them something that they are not likely to get at another organization. Employees, particularly sales reps, will ignore the bad of the company if they know that their manager is on “their side.” It creates an “us versus the rest of the company” mentality that can be inspirational….for a while. If the manager fights for the rep’s compensation, fights battles with marketing about leads, advocates to the CFO for resources and collaborates with the CEO to promote from within the organization – then the sales reps will stay and not look for another job. Believe it or not, it is possible for Sales Teams to thrive even within a toxic environment – IF they have a good sales leader. One thing to consider when evaluating whether or not the manager is a “good” or “bad” manager is to understand where she came from. Was she promoted from within the organization or was she recruited from another company? Did she inherit the existing sales process or did she help create it? It is not uncommon for managers to struggle when managing to a process that they did not have a voice in creating. We’ve also seen sales leaders transform entire organizations – starting with her sales team, improving the sales culture, increasing sales and becoming a shining light within a company. This can be the catalyst that becomes the flywheel of change within an entire organization. It is often said that “revenue solves all problems within a company.” We won’t agree that it always solves ALL of the problems but it certainly makes a lot of people happier. It is amazing what happens when reps start succeeding, making money and hitting their targets. It becomes infectious to the rest of the company. Suddenly, other departments start feeling the same way. Marketing starts feelling the recognition for their months of work, CFOs are happy with the increase in sales, engineers start seeing the fruit of their labor and CEOs start gaining confidence. So, stop blaming your reps and take a closer look in the mirror. Is it your process? Is it your culture? Is it your manager?